If you are fascinated with feng shui and enjoy the exploration of its numerous applications, you must have heard about the Medicine Buddha. Or at least have seen it. You do not have to be a Buddhist to know about different Budhhas, but when it comes to the best and most efficient feng shui applications, every little detail matters. 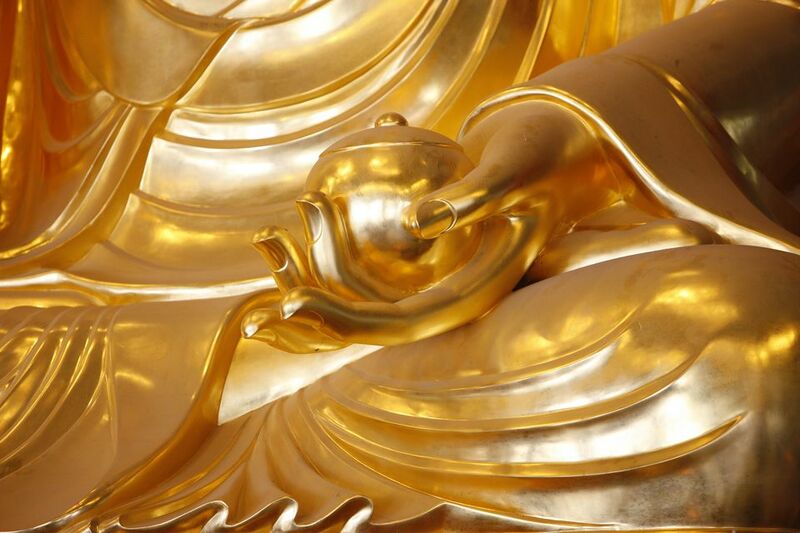 The energy of the Medicine Buddha is different from the energy of Kwan Yin, for example, or from the Laughing Buddha. In its essence, the Buddha energy is one - the energy of Light - but there are different paths to reach it. Because their energy, or function (for the lack of better word) is different, so is the feng shui application of their symbols. The Medicine Buddha is, as the name implies, the Healing Buddha. In the traditional paintings (Tibetan thangkas) he is surrounded by various herbs and medicine, with halos of healing energy radiating from his head and body. As the Medicine Buddha's vow was to help heal all the sick and the injured, he is often called upon to help eliminate sickness. Usually portrayed seated with a jar of medicine in his left hand, often blue-colored, the Medicine Buddha's right hand is resting on his knee in the mudra of blessings, with a stem of a healing plant in between his thumb and forefinger. Sometimes the Medicine Buddha is also called the Blue Buddha, or the Lapis Lazuli Light Buddha. According to the legend, he transformed himself into a radiant blue light Buddha at a large gathering of people and taught/transmitted the knowledge of healing and medicine. Thus, he is often depicted with blue skin or holding a blue medicine jar. The Medicine Buddha mantra has powerful vibrations for healing, both mind and body healing. There are 3 main ways the Medicine Buddha symbol is applied as a feng shui cure. Annual Flying Stars. With the power to dispel sickness, the Medicine Buddha is a very powerful annual feng shui cure for the feng shui bagua area of your home affected by the sickness star energy. For example, in 2012 this challenging energy was in the North bagua area. Thus a Medicine Buddha was a powerful feng shui cure to dissipate the negative star # 2 vibrations. A metal statue, not a painting, is better for this specific feng shui application. A cure for Health. The Medicine Buddha is an excellent feng shui cure for the Health area of your home (Southeast). It is best to choose a painting or an actual wall hanging with the Medicine Buddha rather than a statue for this specific application. Your personal lucky direction to improve health is another good area to place the Medicine Buddha. The energy of Spiritual Health & Awareness. The Center of your home, the Spiritual Growth & Personal Cultivation bagua area (Northeast), as well as your personal altar, can also much benefit from the presence of the Medicine Buddha. As all illness ultimately originates in the mind with the so-called three poisons (attachment, hatred, and ignorance), it is good to have the Medicine Buddha energy on guard. To help you find a Medicine Buddha, we have searched for various online resources that carry the Medicine Buddha symbol, be it in statues, paintings, and even yoga bags, t-shirts, and jewelry. Find your own Medicine Buddha, bring him home and enjoy his healing presence and spiritual medicine. He will help you remember.